Say hello to The Kitchen Generation. You have no idea how ridiculously excited I am to share this with you all. In April of 2010, I met Elissa, Kamran, Lauren and Tessa through twitter. 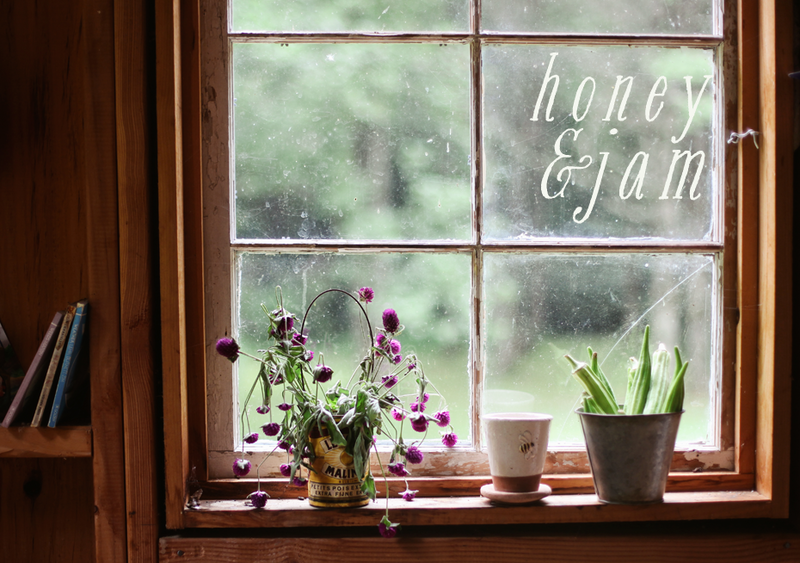 We starting chatting about an idea we had - and idea for a website all about our love of being in the kitchen. We knew we had a unique perspective seeing as how we are all young, in our teens and early twenties. And we wanted to share that with the world. It’s taken nearly a year, but it’s finally here. Soon at The Kitchen Generation, you’ll find all sorts of food related things. Tips, tutorials, stories, and other fun stuff. I hope you’ll pay us a visit. Congratulations. Can't wait to see it! What a great idea! I look forward to checking it out. Best of luck with your new adventure! it looks fabulous! can't wait to see what y'all do there! Hannah, I'm so thrilled for you and your "friends". Congratulations! Congratulations to all of you! So nice to see younger people enjoying food and cooking. Very best wishes with your new project! I can't wait to see what you all come up with on the new site! What a load of wonderful talent! I'm already following you WOOHOO! How exciting! I'm off to check it out! Awesome you guys! What a great way to inspire a younger audience to cook more! Oh wow! Congratulations to you all! I'm about to visit the site, follow the twitter and like the facebook. SO excited, love that you guys are stepping out with your new idea!! This is so cool! As a teenage baker, I look forward to reading TKG. This is a very much needed perspective in the food world. Hi Hannah, I saw your blog in Artful Blogging. Congrats! I loved the article, your story, and your blog. Great idea for the kitchen generation. Just wanted to let you know that I love the new site... So much talent in one place! I'm sure your new venture will be very successful! I've met Elissa and was absolutely floored by her talent and passion. This site looks beautiful congratulations to you all, I can't wait to floow! hannah, i love your idea and the high level of professionalism of your site. also: i love your coconut bread. my boyfriend and i made it yesterday and it's delicious. I'm loving this new site... subscribed to all of the various accounts. Woo hoo! This is terrific, I'm excited to see what you guys create! Congratulations to you and your friends, Hannah! I'm going over now to take a look! 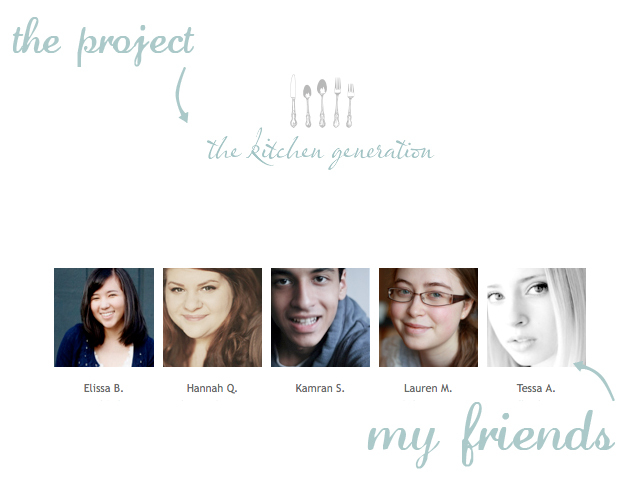 Congrats to all of you - I'm excited to see what the Kitchen Generation has in store! Hannah. As always, I'm so impressed! I was drinking diet coke and eating marshmallows when I was in college. Ha! Great job! im in love with your new site! congrats, on the 'new' website, looking forward to more great photography. its going to be fantastic! I found your blog through the newest edition of "Artful Blogging". I was very inspired by your story. I am currently in my last year of college, and I wish that I had the bravery that you did to follow your heart in your true desires. Your photographs are lovely, and same with your recipes! 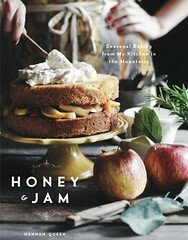 I am a horrible cook, but your recipes look so good that I may have to try some out! :) Congratulations on your new website! As a just-turned-20-year-old who just started writing a food blog, you're a great inspiration. I'm planning to take lots of tips and tricks from the Kitchen Generation and feature them, it looks amazing :) Good luck with everything. Your site is AMAZING! And your close by too! The Sun Will Come Out Tomorrow! :)Believe it! This makes my heart happy to see fellow young people share the same passion :) I'm currently in college and instead of working on a 20-page paper on the Nicaraguan Revolution, I'm brainstorming recipes for a weekend visit from my parents and adoring all the amazing food and photgraphs of my fellow food bloggers. It's quite a challenge! I can't wait to see you guys succeed, Happyolks will be rooting for you %110!